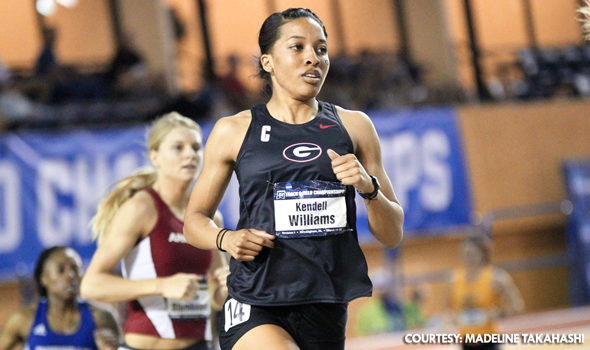 BIRMINGHAM, Ala. — Kendell Williams ended the pentathlon exactly as she started it — by breaking records. For the third consecutive year at the NCAA Division I Indoor Track & Field Championships, Williams established a collegiate record in the event. This time Williams became the first collegian — and fourth American ever — to eclipse the 4700-point barrier with her score of 4703. "I focused on myself and my numbers, because if I did that, the points would take care of themselves," Williams said. "I was happy with the numbers I put up. "I’m happy with the point total and glad to walk away with my third indoor national championship." Williams opened the day by running the fastest time ever run by a collegian in the pentathlon 60-meter hurdles. She crossed the finish line in 8.09 as the biggest threat to her throne, Kansas State’s Akela Jones, tumbled to the ground after tripping over the last hurdle. It was what Williams did in the next two events — the high jump and shot put — that made her coronation all but a formality. In the former, Williams topped her best jump from last year by three centimeters (1.86m to 1.83m). That put Williams 40 points ahead of her record pace in 2015. Then in the shot put, Williams launched the sphere 13.55m (44-5½) and obliterated her personal best by more than four feet. "I had a really good warm-up throw and I’m stronger than I was last year, so I knew I could put a good throw together — it’s just all about getting the technique right," Williams said. "I actually told my teammates not to cheer, because it makes me nervous. I just focused on my coach and that’s how I threw the big throw." After three events last year, Williams had 2800 points. Williams tallied 2927 on Friday afternoon. Following a leap of 6.35m (20-10) in the long jump, Williams needed to run 2:23.30 in the 800 meters to make history. Williams did just that with her time of 2:20.47.